I released I'm One! a few weeks ago and saw it soar up the rankings when I announced a free day promotion. Unfortunately, the surge only lasted that one day and I saw exactly one sale since. But I am also guilty of not following up the promotion with more promoting nor utilizing more free days. One big problem that I think occurred is that I selected the wrong category. Amazon's category selection is not consistent with the way categories are treed on the main site. The first book would have been very deserving of the "Baby-3" sub-category in Children's eBooks, but that was not an option on the KDP dashboard. I am actually still trying to get Amazon to correct this problem and get that book into the right category, but since I published it and launched a free day promotion under different genres, it messed everything up. Advice: find the categories you want to be in before publishing. Follow the instructions on the site for requesting specific categories. You have to select NON-CLASSIFIABLE and then contact Amazon to determine where you want to put it. 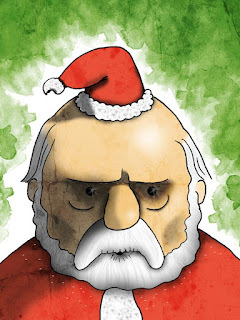 After a nice diversion (illustrating a children’s book), I jumped back into my review of the Seefer Elliot. It took me a few days to read it (what with all the red ink I was tattooing onto the page). I was glad to pick it up after such a long break. I was able to distance myself from the project a little. I came across sentences where I said to myself, “What the hell does that mean?” I’m sure I thought it sounded incredible when I wrote it, but it didn’t hold up well to my reader voice. I picked up a tip somewhere that said to read out loud in a British accent when editing. I don’t know if the comment was a goof or a serious advice. Either way, I heeded it and read most of the book as if I were James Bond. I can't believe how well it worked! Wherever my horrible impression stumbled over a word, I knew that the sentence needed restructuring. Whether it was the accent or not, reading aloud is a definite advantage because it limits your ability to gloss over the words. You are responsible for every word on the page. As I read over the manuscript, I noticed inconsistencies. In some places a character's thoughts were in italics. In others, they were in quotes. In some places, I abbreviated 7th, while in others I spelled it out as seventh. I had 93 uses for a semi-colon. Which was correct? I didn't know. I was referred to The Chicago Manual of Style for help. While verbose, this manual has just about everything you need to know about grammar, style and punctuation. It may not have been the best style-guide to use, but it a)kept me consistent, and b) was free (with a trial membership). FYI, this blog post has a lot of good information on formatting your manuscript in preparation for a professional editor or publisher. It came in handy when setting up my Word doc's line spacing, margins, font sizes, etc. Now I have to take the redlines and actually make the changes. Fun fun. 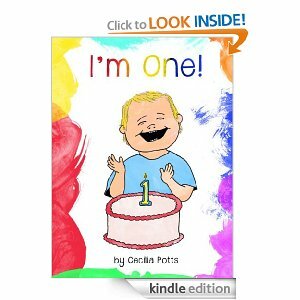 I'm One, is now available on Amazon! It feels so rewarding to have something published and available for all to read. For the last few weeks, I have been relentlessly drawing the illustrations for this book. I wrapped up about a week ago and started assembling the layout of the book and the cover. In one very short month, a book came together and went public. How wonderful is self-publishing? The marketing duties were placed in my hands, so I decided to give the book away for free for today. Through KDP Select, you can promote the book on five selected days to help get the word out. Well, that's what I did and if you are reading this, maybe you'll want to click on over and download a copy. Design your book with both print and digital formats in mind. I chose an 8.5" x 8.5" layout for the print book, but eReader screens are not square. I had to be cognizant of where content lied on the page. I kept margins of 6"x 8" overlayed on my workspace in order to remind me of how things will look when cropped on Kindle. I went through 10 pages of the book before realizing this, and reformatting for the 6:8 ratio was a pain. With a children's book, you will likely upload your book to Createspace as a PDF. Because of this, it is not recommended to allow CS to automatically generate your KDP version. It will royally F it up. Upload your own KDP-ready file. See this reddit thread about KDP image formatting. This was the simplest and most effective template I found. Other templates would produce strange characters throughout the book or space things out oddly. His template was clean and perfect. Also, the recommendation to have images at 600x800 pixels seems to work well with all of the devices I tested it on. Use KDP's mobi creator. Make a zip file containing the HTML and images, then upload it to KDP. It's free and easy. I found little need to buy a third party mobi creator.